From stringing to jawari, sitar fret tying, etc. This page under construction but over the next year look for tuning, string changing, etc. videos to help make your life a little easier! Also we will be developing basic short video lessons for beginners that purchase a sitar from us. Click on each link to view!! Please feel free to save each clip to your hard drive, commercial use or hotlinking not allowed please! How to thread your string. Use this diagram for your main (baaj) string and 5th, 6th & 7th. For the heavier bronze strings just bend down the end, don't thread the string through the hook. Sitar fret tying diagram from Scott Hackleman showing the above video techniqes in a drawing. MIZRABS: Your mizrab should fit on your finger as shown in the pictures, it should grip just behind the first joint and the tip should extend approx. 1/4" from the tip. It shouldn't move at all from side to side and will be somewhat painful while you're getting callouses. To speed up callous development try wearing it when not playing. Some players opt for longer mizrabs which can be more comfortable but this should only be used when your finger is sore and you still want to play as it will hinder your mobility. We offer assistance in getting a good fitting mizrab to your specifications. Please click on the picture to enlarge it and print out for future reference. The reference to Western notes has been set to the key of 'C'. Traditionally Kharaj Pancham sitars are tuned to the key of C# and less frequently D.
Please click on the picture to enlarge it and print out for future reference. The reference to Western notes has been set to the key of 'C'. 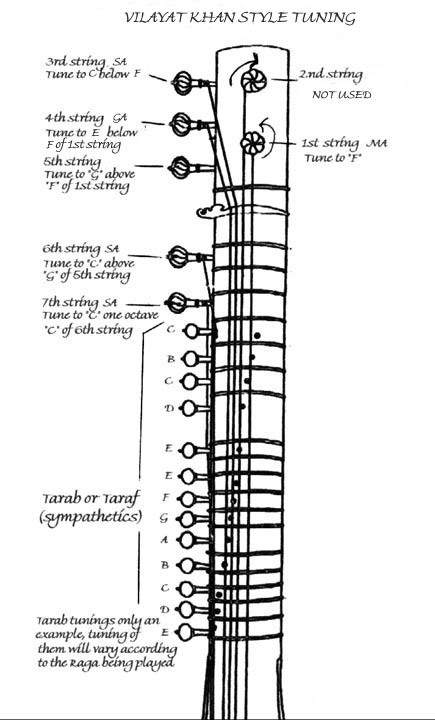 Traditionally Gandhar Pancham sitars are sometimes tuned to the key of C# and more frequently the key of D.
Here's a complete .pdf file courtesy of Scott Hackleman for both tunings with stringing information, everything you need. Download here. "Psssst....Hey buddy, you want to buy a REAL Sitar?" Most sitars, (not all though) start their life as a blank or "white instrument", or "body", whatever you wish to call it. The majority of sitar bodies are made in West Bengal on the outskirts of Kolkata by the thousands and the quality depends on how good the wood is and the skill of the structure person. A sitar 'maker' is actually more of a 'fitter' these days. He of course knows in theory how to make the entire instrument usually but it makes more sense to buy the body outright. The better makers often have more involvement in selecting the body, wood can be selected or given ahead of time or in the absence of a good selection they'll make their own if need be. The maker receives the sitar in unfinished state, no holes for pegs, no frets or bridge. This is where the art of making is most important....the Tabli or soundboard will be taken off and reshaped according to the type of tone needed. Markings for the peg holes are measured, etc. The very best makers will string up the instrument then with a bridge with rough jawari and then let the instrument sit for a week or two as the neck will bend slightly (it's OK). This is so it settles in before the sympathetic peg holes are drilled to ensure that the fret setting will be correct. Proper selection of wood and a masters touch is needed which drives up the price. You are absolutely not going to get this in a cheap sitar that you find on ebay, it'll never happen. If you have a cheap sitar and find that to change the scale causes your fret to run up against the peg then you are the proud owner of a pre-drilled sitar. These leave various unknown craftsman's shop at lumberyards, etc. in varying degrees of finish. More often than not, they're completely done before getting to various shops. A top maker will not use these, or at least on his best offerings he won't. A quality maker will fit the pegs, frets, and bridge himself. He will string up the main strings with a bridge on and let it sit for a few weeks as a slight curve will develop in the neck which is normal. After a period of time when the wood has settled, the frets are put on and then the pegs drilled and installed. Some makers will age the structures, I've seen them aged up to 15 years from Mohan Lal for example. In the old days, the 'legendary' makers had craftsmen in the shop and everything was built right on location. This resulted in a lower quantity of production and varying quality also as there was less to choose from. Having a lot of bodies to choose from is better, a form of outsourcing actually! Another feature of a good Kolkatta sitar is that the construction is more solid. The wood used for necks and tablis is thicker which is the correct way to build them because as the instrument is played over a long period of time the wood becomes more resonant without losing stability or cracking, warping. etc. Many owners of ultra expensive famous brand (fill in the blank) sitar have learned this the hard way as their instrument constantly goes out of tune due to aged thin wood flexing too much. The sacrifice with a thicker sitar is that they're sometimes not as loud when new, but the payoff can be worth it in the long run. There are exceptions to the Kolkata method though as is seen in Miraj, India. There are a number of shops that still make their own instruments, some of them quite beautiful in appearance. Miraj is known for its Tanpuras which are very resonant due to the style of construction of the instrument with a thin and more rounded tabli.. In the past they had carried over this technique on their sitars which often resulted in a lack of sound balance and most likely a shorter life of the instrument in some cases. Today however with the influx of Kolkata structures in the past 10 years the local making techniques have adapted and the tone quality in some cases is equal to that if not better than their Kolkata counterparts. The downside of the Kolkata bodies is that they're cheaper so now about 85% of Miraj instruments actually were made in Kolkata! Exceptions to this would be Naeem Sitarmaker and RA Sitarmaker although they will use Kolkata structures for the domestic market if price is a factor. I have been insistent on exclusively Miraj made instruments from the makers there to promote and sustain the workers and to insure that all these techniques aren't lost.